Information: Florence Hudson Topping Botsford, compiler and editor of many songbooks. Botsford collection of folk songs, with English versions by American poets; compiled and edited by Florence Hudson Botsford; introduction by Carl Enger, Volume 3. New York: Schirmer, 1933, 1 piano-vocal score. (OCLC 22837281). Botsford collection of folk songs, with English versions by American poets; compiled and edited by Florence Hudson Botsford; introduction by Carl Enger, volume II. New York: Schirmer, 1931, 1 piano-vocal score. (OCLC 22920449). Botsford collection of folk songs. Tune-books: melodies and English words, without accompaniments; compiled and edited by Florence Hudson Botsford. New York: Schirmer, 1930-1933, 3 volumes of music. (OCLC 16398215). Botsford collection of folk songs, with English versions by American poets; compiled and edited by Florence Hudson Botsford; introduction by Carl Enger, revised edition. New York: Schirmer, 1930-1933, 3 volume score. (OCLC 6161626 & 25363751). Botsford collection of folk songs, with English versions by American poets; compiled and edited by Florence Hudson Botsford; introduction by Carl Enger. New York: Schirmer, 1930-1933, microfilm. (OCLC 4397681). Botsford collection of folk songs, with English versions by American poets; compiled and edited by Florence Hudson Botsford; introduction by Carl Enger. New York: Schirmer, 1922-1930, 3 volume score. (OCLC 21006385). Botsford collection of folk songs, volume 1. Songs from the Americas, Asia and Africa: with English versions by American poets; compiled and edited by Florence Hudson Botsford; introduction by Carl Enger. New York: Schirmer, 1950, 1 piano-vocal score. (OCLC 22837352 & 15537434). Christmas & New Year songs. Florence Hudson Botsford. New York: Womans Press, 1922, 56p. (OCLC 8498667 & 12539834). Christmas & New Year songs: from Folk songs of many peoples, compiled by Florence H. Botsford. New York: Schirmer, 1922, 56p. (OCLC 5113605). 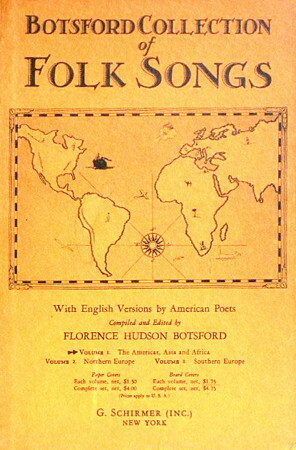 Folk songs of many peoples, with English versions by American poets, compiled and edited by Florence Hudson Botsford. New York: Womans Press, 1921-2, 2v. (OCLC 1021201); 1921-31, 3v. (OCLC 21514222). Vol. 2 contains 8 Native American songs. Folk songs of Poland, reprinted from Volume 1 of Folk songs of many peoples; compiled by Florence H. Botsford. New York: Womans Press, 1922, 51p. (OCLC 3407125). Russian folk songs, reprinted from Volume 1 of Folk songs of many peoples; compiled by Florence H. Botsford. New York: Womans Press, 1922, 39p. (OCLC 5650857). Russian folk songs; edited and compiled by Florence H. Botsford; with an introduction by Boris Brasol. New York: Schirmer, 1929, 50p. (OCLC 6427674 & 1883942). Sing around the world songs. Florence Hudson Botsford. New York: Womans Press, 1925. (OCLC 21086522). Songs of Finland; edited and collected by Florence Hudson Botsford, with original texts and English versions by American poets. New York: Schirmer, 1931, 19p. (OCLC 25640159). Songs of the Americas, from the Botsford collection of folk-songs, collected and edited by Florence Hudson Botsford. New York: Schirmer, 1930, 106p. (OCLC 2134778). The universal folk songster for home, school and community, compiled by Florence Hudson Botsford. New York: Schirmer, 1937, 154p. (OCLC 173435).